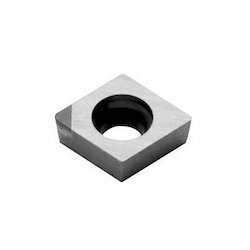 Our product range includes a wide range of cbn inserts. Packing Size Width 2" X Length 4"
[Although machining ferrous materials is not recommended for PDC tools, they can be successfully used for certain cast iron applications where high speed is not attainable and where polycrystalline cubic boron Nitride (PCBN), which is conventionally recommended for cast iron machining, cannot be used. In such applications, it is seen that PCD wears more slowly at lower speeds .When a critical speeds. When a critical speed is reached, it starts wearing faster because at this speed, the heat generated while machining is sufficient to cause the chemical reaction between iron and carbon. However, at low speeds, PCD tools have proved their worth on cast iron material by achieving much better results than conventional tools, maintaining high consistency and accuracy of the work piece for very long time. PCBN (Polycrystalline Cubic Boron Nitride) cutting tools are designed to machine extremely hard or abrasive materials at high metal-removal rates. PCBN tools are used in a wide range of machining operations such as milling, grooving, turning, facing and boring, They are recommended for machining hardened ferrous metals such as hardened steels, cast irons and super alloys.